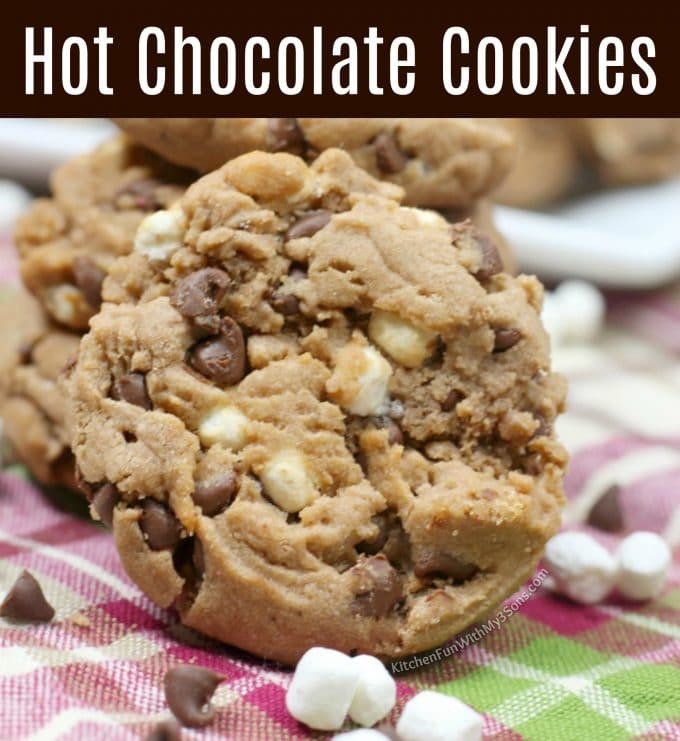 These hot chocolate cookies with bits of marshmallows mini chocolate chips are literally made with hot cocoa. These are the best winter cookie recipe ever! 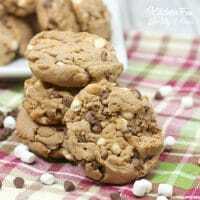 I love baking cookies and finding new recipes to try. The smell that fills your house when cookie dough cooks in the oven is my favorite thing. Once you make these you’ve got to try our other Hot Cocoa Cookies recipe and our Peanut Butter Muddy Buddy Cookies. We have hundreds of cookie recipes right here! My kids and I just made hot cocoa the other day when we had a big snow storm. We may have a new cold weather tradition: hot chocolate cookies! 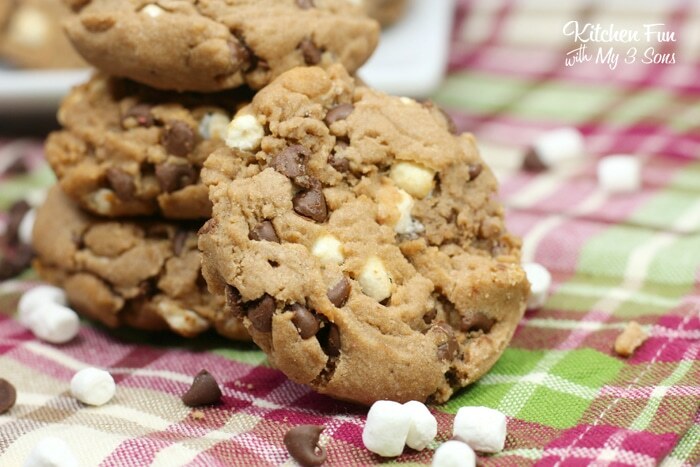 Everyone loves chocolate chips and marshmallows, right? Putting those ingredients with sweet cream butter, vanilla and cocoa mix is bound to make for a delicious treat. 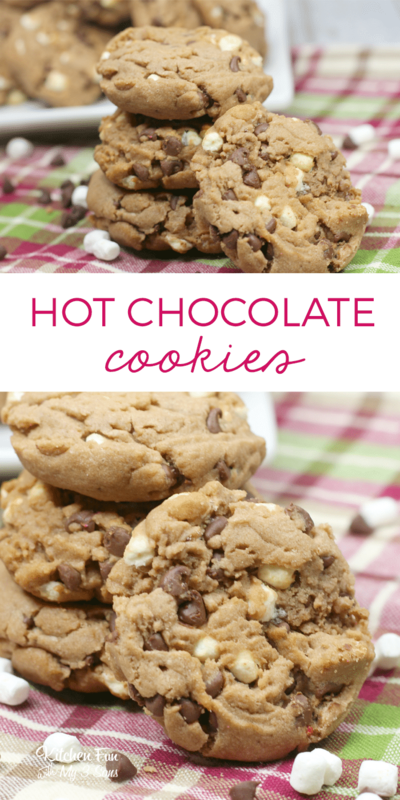 You can add to these hot chocolate cookies a number of other fun ingredients. We love to put in peanut butter chips, caramel chips, coconut flakes, nuts or sprinkles. Don’t forget to make sure you’ve softened your butter before making these (or any chocolate chips cookies). A heated glass over top of your butter is the best way to get it soft and ready for cookie baking. 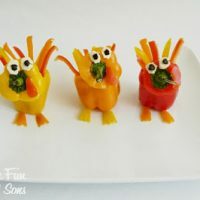 When they’re all ready, serve them next to a glass of warm hot cocoa! Using a standing mixer, beat together the butter and brown sugar until smooth. 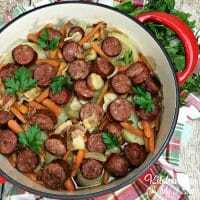 In a large bowl, whisk together the flour, hot cocoa mix, baking soda, and baking powder. Stir in the marshmallow bits and mini chocolate chips. Flatten the dough into round discs. Allow to cool completely on a wire rack before enjoying with a nice cup of hot chocolate! Next Post » Draw 4 Rule – Turns out most of us have been playing Uno wrong for years! 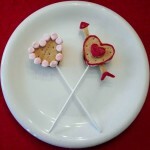 Going to make & send these to my grandkids for Valentines Day!